OIT is a journey, it isn’t quick or easy. Kaitlyn had to put all of her fears aside and ingest the very food that she has been warned about her entire life. She was terrified at first and then slowly warmed to the idea of going in for the initial appointment. Dr. Agrawal was fabulous with her and very understanding of her fears. 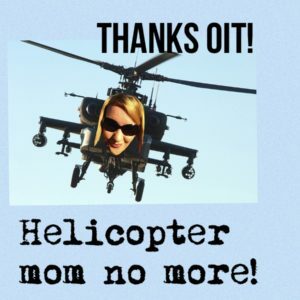 We moved forward with scheduling our initial appointment to begin OIT. Other than the nerves, it was relatively easy. We were armed with entertainment and foods to help coat her stomach. She didn’t make it to the highest dose that day because she was having hives, stomach pain and strange bumps on her tongue that came up after the third of fourth dose. We went home with her liquid dose and started the life changing process of OIT dosing once a day every day with a two hour rest period to ensure her body doesn’t fight peanut. Kaitlyn had a lot of nerves for months but she continued to take her dose. We slowly continued to increase until September when everything came crashing down. Kaitlyn got sick and had horrible stomach pain, we decreased her dose more and more and she still had reactions so we finally had to stop. Kaitlyn felt horrible for weeks. 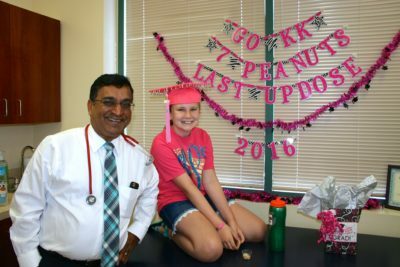 After endless blood work, ultrasounds, and doctor appointments with Dr. Agrawal and our pediatrician they concluded that she had a stomach virus that was further irritated by her peanut dose and possibly a stomach ulcer. Our family was crushed to stop OIT but assured by Dr. Agrawal that we would begin again when she was feeling better. We did start OIT again but had to go back to a much lower dose. Kaitlyn was beyond terrified and highly discouraged by starting the process over. Dr. Agrawal made several attempts to encourage her and get her to take her dose. It was agonizing to start over the process that we had worked so hard to get through. As of July 2016, Kaitlyn has successfully increased to 7000mg (roughly 7 whole peanuts) and reached maintenance. It’s absolutely amazing the freedom for her and our family to eat at restaurants we’ve never had the luxury of eating at, or consuming foods that we never dreamed of, and to relax just a little while she is at school or a playdate. Every little girl has big dreams. Kaitlyn’s big dreams are ones that may seem small to the average kid; to fly on an airplane, to be able to eat a cookie cake with her friends, to be able to attend sleepovers, and to not have her Mom hover so closely. The risk of contamination was too great for her to enjoy birthday cake, cookies, or most any food that her parents couldn’t verify were 100% safe. Being left out of social functions and school parties has taken its toll on Kaitlyn emotionally. Kaitlyn’s big dreams are to “fly to Paris,” to eat at the Great American Cookie Company and to one day become an allergist! And, thanks to Dr. Agrawal and OIT her dreams are now becoming reality! She ate her very first Double Doozie cookie cake and LOVED it! We keep a blog about our OIT journey www.kknaughtynuts.blogspot.com where we share all of the trials and triumphs so feel free to read more details of Kaitlyn’s inspiring OIT journey.